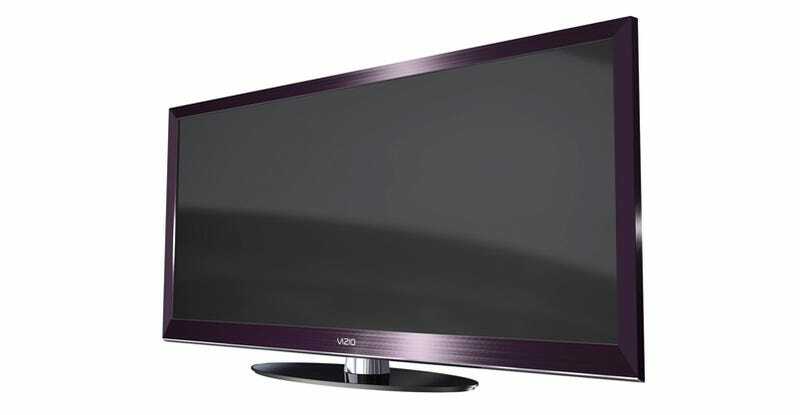 The Vizio TV I'm most interested in: Their 58-inch 21x9 Cinema Wide TV with a resolution of 2560x1080. Like their other XVT sets, it's got wireless HDMI and built-in Wi-Fi, though is only 120Hz. No price or hard ship date. Taking a major step forward in enabling viewers to experience a fully immersive widescreen film experience without a separate projector and screen, VIZIO's first Cinema Wide Display, the XVTPRO580CD offers the ultimate experience for the movie enthusiast. This 58" Razor LED display has a 21x9 aspect ratio, with an incredible resolution of 2560 x 1080p, allowing consumers to view 2.35:1 "Scope" aspect ratio films using the entire display area, with no loss of resolution and no black bars. With 1 million to 1 Mega Dynamic Contrast Ratio™, Smart Dimming™, and 120 Hz with Smooth Motion technology, the XVTPRO580CD delivers brilliant details and rich colors to bring the cinematic experience into the home. Its striking wide appearance is further enhanced by its brushed aluminum chassis. The Cinema Wide Display also includes VIA, built-in wireless (802.11n dual-band) or wired networking, and a Bluetooth universal remote control with sliding QWERTY keyboard. It is expected to ship later this year.